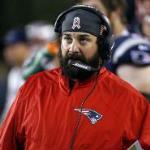 The New England Patriots defensive coordinator Matt Patricia, who was part of the team that lost to the Philadelphia Eagles in Super Bowl LII, has been hired as the new Detroit Lions head coach despite the fact that many reports initially pegged him with the New York Giants. In Detroit, he will be reunited with Bob Quinn, the former Assistant director of pro personnel for the Patriots, and who has been looking for a new head coach since the Lions parted ways with Jim Caldwell at the end of last season. Patricia interviewed last year with the Los Angeles Chargers and Saint Louis Rams and impressed them with his knowledge but was not hired and thus stayed with the Patriots as defensive coordinator. Patricia will have some great defensive tools to work with in Detroit and will have to help the Lions develop a running game. He will have the advantage of working with Quinn, an executive he already knows and that will allow him to start looking into the roster and decide together what kind of players they want and need to turn the Lions into a winning team. Quinn said in a statement that they were looking for a leader that could take the team to the next level and he’s confident they have found that in Patricia as he’s been preparing for this opportunity his entire career and he’s ready for the responsibility and its challenges. Unlike other teams that are in complete disarray when they fire a coach the Lions are fresh off a 9-7 season and they’re not that bad. They have the potential to become a playoff contender in the next couple of seasons if the right pieces fall into place despite the fact that they are in a very tough decision with the Green Bay Packers, the Minnesota Vikings, and the quickly improving Chicago Bears. Detroit underperformed defensively this season, but they have a defensive unit with very talented pass rushers, good secondary players and a lot of player with huge potential. Patricia will make the players on that side of the ball even better due to the attention to detail that he brings and allows him to progressively make his players better. Offensively they also have some good pieces in place and has the advantage of having a talented quarterback like Matt Stafford, who is a consistent playmaker, surrounded with some good players. Patricia just needs to bring a good offensive coordinator to help him put that side of the ball together, make it jell and unify it so they can better perform under pressure against the tough division rivals. Patricia is relatively young at 43 years old, but he has an incredible resume, which has been built throughout his entire career with the Patriots, which began in 2004. Since then he has helped the Patriots win three Super Bowls and six conference titles.